Well, after having a T-shirt day yesterday we are back to winter today and bitterly cold tonight. Totally unhappy, this is too late in the spring for temps that cold. Anyway, my image today is the last one I played for hosting the Bird Poker theme which was great fun to see all the neat images people had. 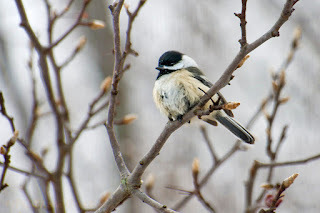 Today I wanted birds with bokeh so I am sharing this Black Cap Chickadee that I captured in Missouri at the in-laws home. They rarely sit still but I got lucky with this guy.